You will need 2 stove pipe elbows, three straight pieces of stove pipe and one can of white spray paint. A nice addition is a flood light & extension cord to illuminate the cane. In 1985 the cost of these items was about $25. excluding the extension cord. 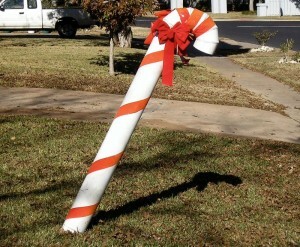 After spraying the cane, wrap it with 3 inch red plastic ribbon. Pound a metal pole, or broom handle in the ground about 4 or 5 feet back from the sidewalk at a 45 degree angle. The cane will slide down over it. Some neighbors add a string of lights. Photo taken on Bullard Dr.